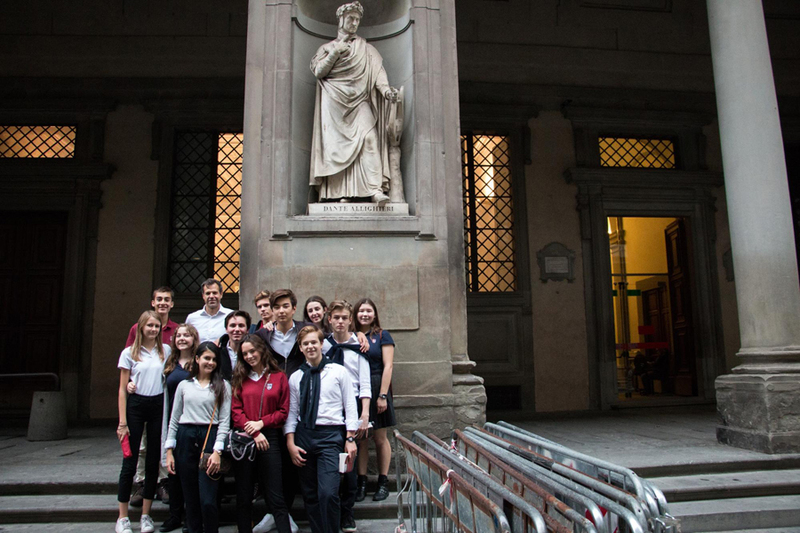 Joy Mack ’21 was one of 12 Honors World Literature students who traveled to Florence for Fall Academic Travel in order to further her studies of the illustrious Italian poet Dante Alighieri. Some see rain as a gentle thing, perhaps on a chilly fall night as you listen to it hit your window. Others, like the 10th grade Honors World Literature class, see it as a harsh thing, shooting at you from all directions on the famous Ponte Vecchio in Florence. As we stood together in a huddle, holding our somewhat useless umbrellas in the direction the rain seemed to be coming from, we suddenly realized that this was the best first day of our trip imaginable. As different as all 12 students were, we all bonded after that first day because it is not every day you get stuck in a storm with 11 other people. Needless to say, it was an interesting and wet start to our trip to Florence, where we had come with our Honors World Literature teacher, Dr. Love, to further our studies of Dante. 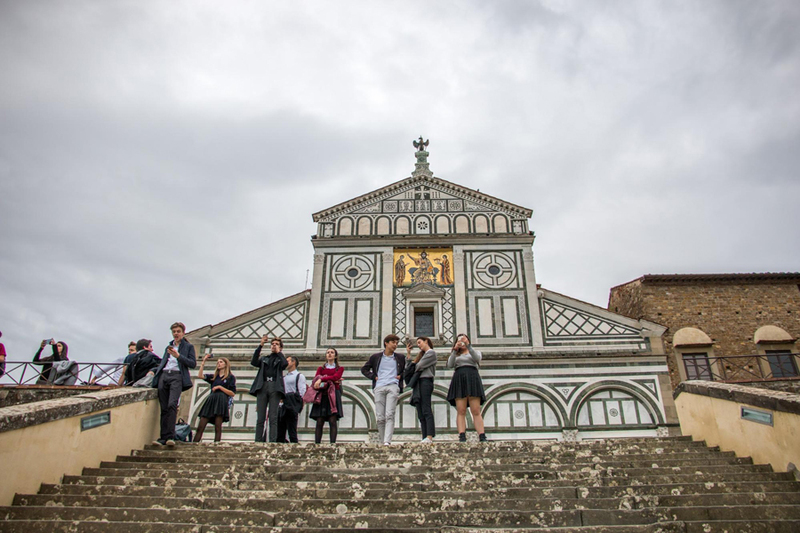 See more High School Fall Academic Travel photos on the TASIS SmugMug page. An all-time favorite place to stop at was the chaperone-suggested sandwich shop, I Fratellini. The new laws that prohibit snacking on the street did not deter us from our daily goal of enjoying one amazing sandwich for lunch. 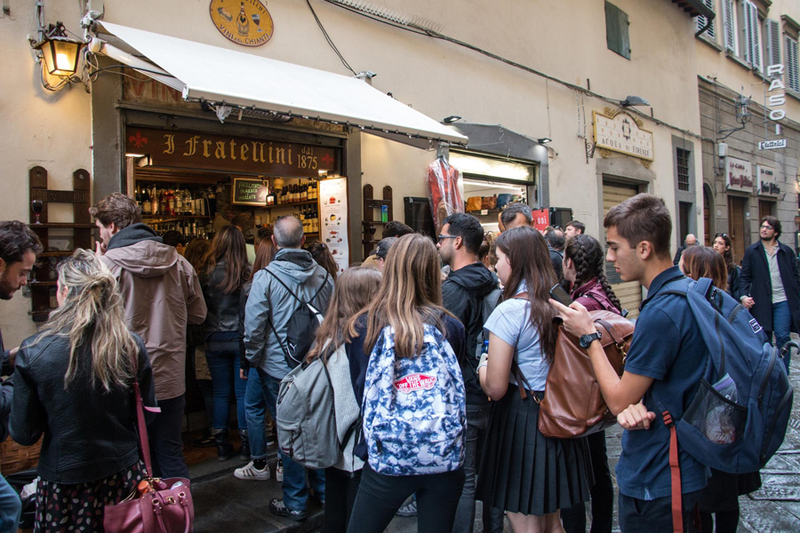 Not only were the sandwiches amazing, as Florence is known for it, but many memorable moments also occurred on that very street. Josip Biondic, having had an encounter with pigeons and his pants, would describe one of the many times at this shop as “tragic yet hilarious and memorable.” Regardless, we can definitely say that one of our most popular spots helped us realize why Florence is known for its sandwiches, and we highly recommend them! Another amazing place we visited was the Santa Maria Novella. As our group took the time to wander around and have a glance at the intricate exterior and interior of this palace-like place, we could not help but notice the hidden meaning behind every statue in it as well as the beauty behind the people that were praying there. To have a place to go to worship as breathtaking as that would be, as noted by many of us on the trip, an experience every week that would make us want to cry. We could hear every step someone took and the rain tapping on the stained glass windows as someone lit a candle for a loved one. Our classmate Sofia Rosso was “amazed by the architecture inside the church and how they were able to build such a big moment.” It was unbelievable to think that someone from so long ago had the skills, determination, and imagination to come up with such a detailed and large-scale piece of artwork that is still here for us to visit today. Thinking back, I now realize that every single place we visited, large or small, had a hidden meaning behind it. Whether it was Dante’s house or the San Miniato al Monte—Dante’s paradise—there was a reason for all of Dr. Love’s locations, and that was the true beauty behind this trip. As students, we learn to read between the lines and find the hidden meaning in the text, but we never applied those skills to life and tangible places before. That is what made this trip truly special. 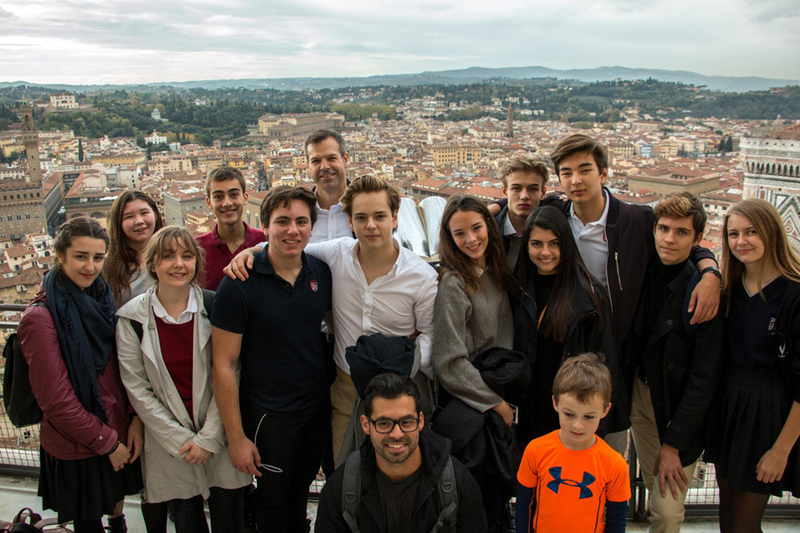 While speaking with those who went on the trip, a fellow Dante-lover said, “The city was beautiful and the activities were interesting.” The opportunity for students to be immersed in their curriculum through Academic Travel is something TASIS offers that many schools do not. 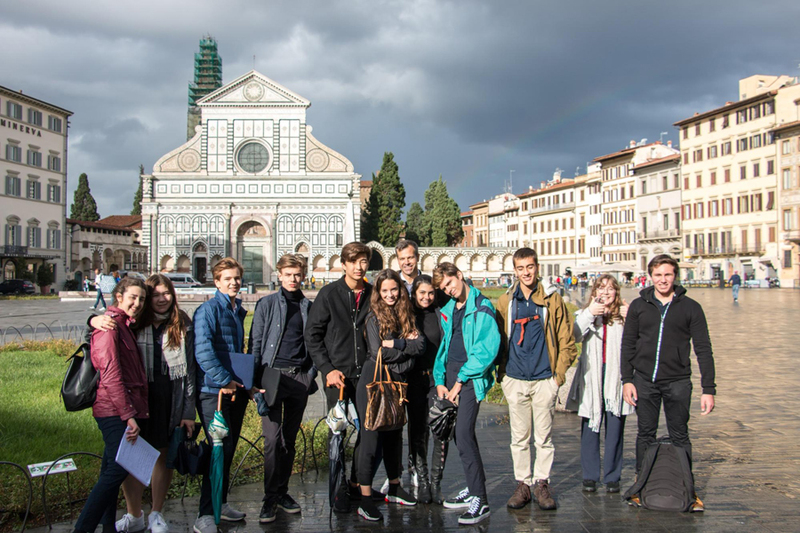 No matter the rain storms and other trials that challenged our group in Florence this year, we overcame every tribulation that was thrown our way and enjoyed this trip, staying positive and soaking up all the knowledge we could about Dante and this magnificent city. Lastly, I would like to say that if you are going on this trip with TASIS in the future, I hope you truly enjoy the five fleeting days you spend there. Finally, thank you to all the chaperones and students who made this trip unforgettable. from completing Dr. Love’s annual challenge of reciting an entire canto from Dante’s Inferno.